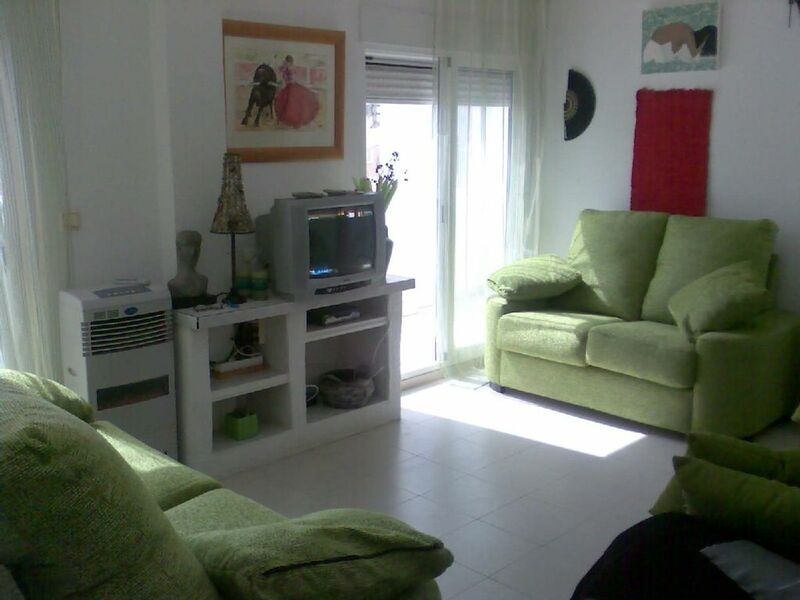 The large apartment is in a private complex with gardens and pool. There is a large terrace with table, chairs and sun loungers which is very private. The beach with palm trees restaurants and bars is 3 min walk a way. There is a supermarket at the top of street along the beach front. There is a public pool complex which has crazy golf, restaurants and entertainment nearby. Alicante airport is 40 minute drive to the apartment. We can supply a phone number for an English taxi company. Torrevieja town centre is a 15 minute walk or the bus service which runs quite frequently takes about 3 min. There is a street market every day in the town centre and on Friday there is one of the biggest markets in Spain where you will find a bargain. There only a few local bars open at this time of year so we rarely went out in the evenings. Having Aldi a short walk away was very handy and there is a decent bus service to get you to other resorts. We made good use of the terrace on the sunny days and the apartment was well equipped for a long stay. Great location and amazing sun terrace! The apartment is minutes walk from the beach and you pass a supermarket on the way that has some lively beach bars behind it. There is an Aldi not to far away. The town centre is about a 40min walk and then another 20min to the end of the promenade. We stayed at the end of October so the pool area was closed but at least parking the hire car was never an issue! Lovely apartment fully equipped, bed comfortable, only 2 of us plenty of room, had good weather so when in were out on terrace which is large, wi fi connection was good, unfortunately pool closed 1st Oct as was the nearby pool with restaurant and entertainment but that down to the season, 5 minute walk to dialprix supermarket and to bus stop, plenty bars and restaurants nearby and only costs 1.35 euro each on any bus (ten min trip)and 8 in taxi to marina area, used radio taxi and were with us outside apartment within 5 mins, the sea is just the other side of the supermarket but first sunbathing beach 15 min walk. Torrevieja has all the amenities of a large city. Overall this was the ideal location out of the hustle and bustle of the town but walk able . We would certainly look to this apartment’s availability first on future trips. We would recommend this apartment to anyone. It was very well equipped with everything there that we needed. It was very private and just a couple of minutes down stairs to the pool. We used the pool most days and it was usually pretty quiet. Loved the large terrace, spent a lot of time there. The nearby supermarket was great with prices very reasonable, especially the wine! We walked into Torrevieja centre a few times - an easy walk, stopping on the way for refreshments and tapas. David, the owner, was very helpful with everything during the booking process. We've stayed before for a week, this time we had 2.Hire car parked below balcony in sight, Good neighbourhood withthe block over the road having a large number of permanent Spanish residents. It feels good. The community is well kept with a good clean pool which in late June didn't have more than a handful of people in it. We walked to the beach a couple of times and it's a good sandy beach. Not judgemental if you are carrying a few extra pounds, lol. Great for children as gently shelves. Everything else as it was last year. Air-con in lounge and bedroom, rooms a good size, washing machine in utility with penned off area to dry. Two supermarkets in short walking distance one an Also. Happy customers. A huge balcony with the sun all day, everything you need. Quiet, pretty gated property with pool a minutes walk. Try Santa Maria restaurant behind Dualprix supermarket for great menu, huge portions, cheap prices & lovely staff. Good communication with owner of apartment who arranged pick up from airport, about 40 minutes roughly. Quite a few stairs to get to apartment, might not be suitable for people with mobility issues, otherwise can’t fault it.